My mom writes a Christmas letter (almost) every year to update our friends and family about the goings-on in our lives. I didn’t write a Christmas letter because it’s only Peter and I, and we’re really boring. But then I was driving to work the other morning and thinking about our year, and I was like, “Actually, we’ve had the best year ever! !” So instead of getting a Christmas letter in the mail, you’re getting a virtual one. 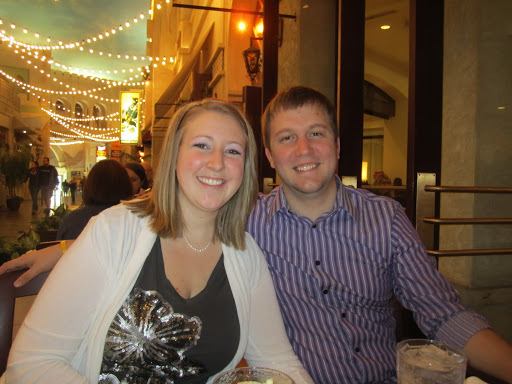 Our year began as a newly engaged couple who thought they had 17 months to plan their wedding. We took a trip to Las Vegas for a long weekend with our friends Kim and Stew right away in January to get a break from the cold, snow-less Wisconsin weather. 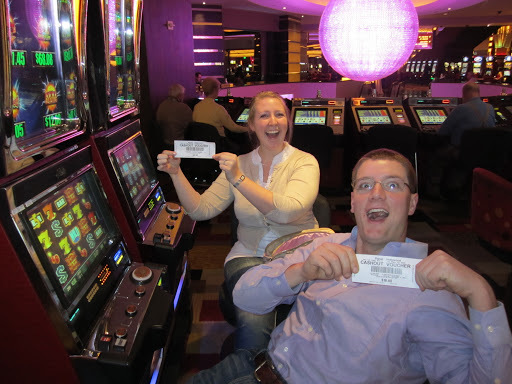 Great trip overall: I lost money, but Peter won money so in the end I didn’t care because in 17 months our finances would be one in the same. My first cash-out. I think that I put in $1.00 and came back with $3.41. So that’s good! 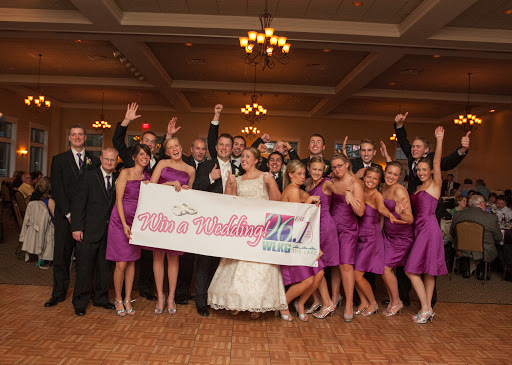 Also in January, we entered a wedding contest with LAKE 96.1 out of Lake Geneva. 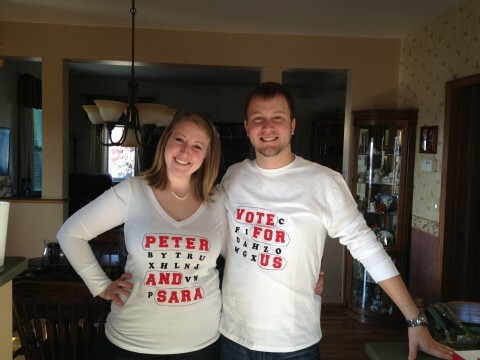 We were one of the three couples chosen to be voted upon to win. February came and we had to sell ourselves at the Winterfest in Lake Geneva to get people to vote for us. That was fun and embarrassing, just how I like it. The day before Valentine’s Day, we found out that we won the wedding! And that we were getting married in April! 14 months earlier than we originally planned! We were very shocked and surprised, and I still can’t believe that we won. February, March, and April were all a blur with appointments, breakdowns, stress, and excitement as we, along with the LAKE 96.1 listeners, our families and friends planned our wedding. Monday mornings were highly anticipated, as we got a new piece of our wedding puzzle at that time, along with the rest of the planners. It was really exciting, but at times I was ready to rip my hair out! But then I would think about how I wanted my hair to look nice for my wedding, so I wouldn’t rip my hair out. In the midst of wedding planning, both of us got promotions at work, so that increased our excitement level. A lot. A ton, actually. We honeymooned in St. Thomas, which was just what we needed after 10 stressful weeks. Lots of margaritas, pina coladas, and sun were consumed. It was great! A month after the wedding, we decided to start looking at houses, and at the end of June found our dream house and put an offer in. The offer was accepted and we went through paperwork and moved at the end of August. We both love our house SO much, and want to be in it all the time. I promise that soon I will put up pictures of the house so that you can see it. It really is great. Fall flew by, I literally can’t even remember what happened to September and October. In November I took a 3 week trip to South Africa and Brazil for work. I learned a lot, met a lot of great people, and got to see a lot of amazing things. I love my job. Now all of a sudden it’s December and we are closing out the year as a young married couple, and we are so beyond blessed that it isn’t even funny. I’m still a little dizzy thinking about our incredible year. It’s actually awesome that 2012 was the best year every because the world is supposed to end later this week, so it worked out for the best. But seriously – thank you SO much for voting for us to win our wedding and not de-friending me because I was so obnoxious about self-promotion. I was annoyed with MYSELF. BUT. Without that change of plans in February, the rest of the year wouldn’t have happened at ALL like it did. 2012 will be a tough one to beat, but that’s ok, because I think we’ll need 2013 to fully soak in everything that has happened this year.